Grant writing is a daunting task for fire departments of all makeups; however, dangling funds, ripe for the picking, prompt savvy departments to reach for them to ease budgetary concerns. 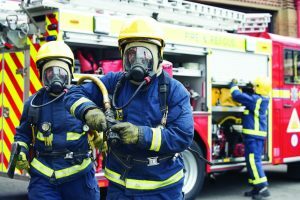 Each year fire departments are letting funding dollars for a variety of key components — gear, apparatuses, training and more — pass them by as they opt not to submit grant applications. While some reap grant success others have sidelined themselves, deeming the process too time-consuming or overly complicated. But they may want to reconsider not going after the available funds. “It (grant information) is the No. 1 thing our members ask for,” Dave Finger, chief of Legislative and Regulatory Affairs for the National Volunteer Fire Council, said. Despite the council providing this information, he noted within the past six to seven years there has been a significant fall off in the number of departments seeking grant funding, particularly volunteer departments. For instance, in fiscal year 2009 11,204 volunteer departments applied for the Assistance to Firefighters Grant program, or AFG. That number decreased to 8,828 applicants the following fiscal year. By the time fiscal year 2014 arrived, the number of volunteer department applicants had dwindled to 4,609. Across the board, the number of AFG applicants in combination departments; in paid, on-call departments; and in career departments also saw decreases in varying scales from FY 2009 to FY 2014. The Staffing for Adequate Fire and Emergency Response grant, known as SAFER, has also seen decreases in applicants during different fiscal years. On an anecdotal level, Finger stated one of the biggest reasons he’s heard for drop-offs has been the federal System for Award Management, or SAM. SAM, however, is not the only deterrent keeping departments from pursuing grant funding. The situation is complicated, according to Finger, by the fact there is less funding to go around. For example, the federal AFG program saw $565 million in appropriations in FY 2009. That number was reduced to $340 million in FY 2014. With so much competition, it’s vital to put a department’s best foot forward through its narrative. Brant stated a narrative should describe the project a department wants to complete and be as specific as possible. Departments should first cement a plan for those narratives. Brant suggested they be clear and give information, but also be concise because the narratives have character limits attached to them. “You have to have time to plan,” he said. “Know the demographic profiles of your community. Since AFG funds are very limited, in general, only high-priority items are receiving consideration. Focus your application on these items. Finger praised the FEMA process, noting the fire service has input into its criteria. “The fire service is involved all the way through.” Fire service members help determine which departments should receive funding. While funding is down, success rates have remained nearly the same from FY 2009 to FY 2014, though the low number of applicants plays a role in that. The percentage of successful departments actually rose from FY 2013 to FY 2014: volunteer departments to 23.60 percent from 21.30 percent; combination departments to 20.50 percent from 19 percent; paid on call departments to 14.50 percent from 12.70 percent; and career departments to 25.80 percent from 22 percent. SAFER success rates over the fiscal years have also remained comparable and exhibited improvement from FY 2013 to FY 2014, except for career departments which experienced a success rate decrease from 25.10 percent in FY 2013 to 22.90 percent in FY 2014. “Emphasize a plan and do it early; don’t wait until the last minute, because it shows,” Brant said. He cannot stress enough taking the time to properly plan can lead a department to success. The fire department Brant volunteers with in rural, west-central Pennsylvania has experienced plenty of success in the grant process. Five out of eight years they received needed funding. The federal government offers tools to aid grant seekers, like webinars that become available when it gets closer to grant openings. FEMA also has regional offices departments can call to get help. 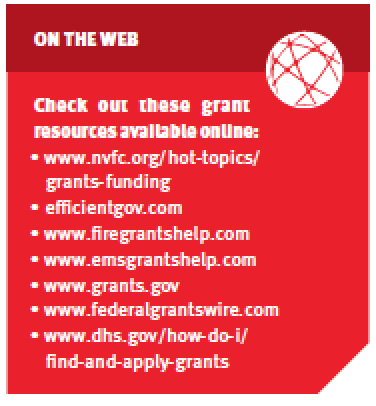 NVFC has developed a Fire and Emergency Services Grant Writing Guide; an Assistance to Firefighters Grant Checklist, with help from FireGrantsHelp; video podcasts; grant and funding training; and more. Sites like FireGrantsHelp.com, EfficientGov and EmsGrantsHelp.com, provide tools as well, some of which are free. Both Brant and Finger agree it is vital to have a third party read a department’s narratives before submitting a grant. NVFC has a peer review program available to its members; though Finger said many are not taking advantage of the opportunity. “It’s not all gloom and doom. There are thousands of grants,” he said. While a grant here or there might feel like a drop in the bucket, Finger pointed out it can be a big drop.